Succulents and More: Look what I won! Last November, I joined the Sacramento Cactus and Succulent Society (SCSS) and I’ve attended each monthly meeting since. It’s a great group, with a tremendous amount of cumulative knowledge, and I come home from each get-together with renewed enthusiasm. There is a raffle at each meeting, and I usually buy $5 worth of tickets. 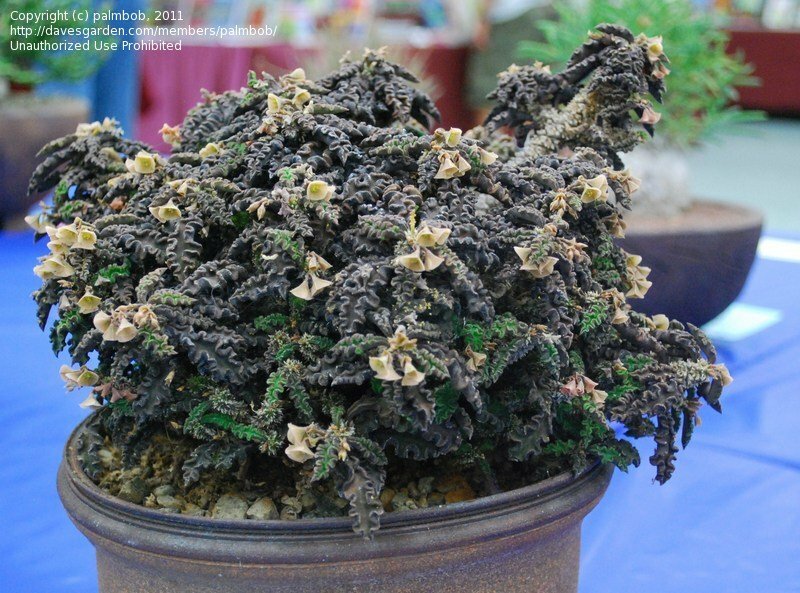 Plants are purchased specifically for the raffle, usually from a succulent nursery. At the February meeting, the plants came from The Great Petaluma Desert, a nursery specializing in caudiciforms and pachycauls, or “fat plants,” as they are so lovingly called by collectors. As they often say about children or pets, it’s so ugly, only a mother could love it. Actually, I don’t think it’s ugly at all. I love the tentacle-like stems and the corky skin. And if you look closely, you’ll see that it’s starting to leaf out. This oddball plant is a Euphorbia decaryi var. spirosticha, a Madagascar native which in the spring is covered with small crinkly leaves and eventually delicate yellow flowers. Take a look at this plant: It’s fully leafed out and in bloom. Ugly or not is in the eye of the beholder. I’m happy to have it brought it home. And I can’t wait to see what I might win in the March raffle. Jack, welcome to my blog! Thank you very much for visiting and for leaving a comment. I would love it if you followed by blog. You can follow by selecting an option under Subscribe To on the right. Or you can Follow This Blog button under Networked Blogs at the bottom right. If you're on Facebook, you can also read my posts at https://www.facebook.com/pages/Bamboo-Succulents-and-More/123527224378390. I hope this helps! I also won a new cactus this week at the monthly Cactus & Succulent meeting. Although I think I'm more impressed with your find then mine. I love euphorbias, the strange caudex forming ones are even better. Great find! Well done! Its always nice when you win something, especially that curious looking plant!